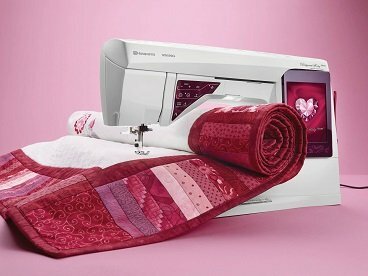 The HUSQVARNA VIKING® DESIGNER RUBY Royale™ sewing and embroidery machine is our heir to the throne, a true princess. It makes it easy and rewarding to create anything your heart desires for the most important people and occasions in your life. Discover innovative sewing and embroidery techniques and built-in convenience features that help bring your creativity to the next level. The DESIGNER RUBY Royale™ machine is completely intuitive and provides regal quality in every single detail! The unique EXCLUSIVE SENSOR SYSTEM™ technology senses your fabric thickness for perfect, even feeding and provides for excellent presser foot control. The Exclusive SEWING ADVISOR® and EMBROIDERY ADVISOR™ feature provides guidance and optimizes your sewing and embroidery. Experience more beautiful embroidery than ever with fewer adjustments, even with challenging metallic threads, thanks to the innovative deLuxe™ Stitch System. The Large Interactive Screen provides vibrant colors and an excellent wide view. Use the first in the industry, patent pending Dimensional Stitches to add appliqué fabric for exceptional decorative results. Choose from a variety of built-in shapes to create appliqué embroideries instantly with the Basic Design Appliqué feature. Your DESIGNER RUBY Royale™ machine reduces your embroidery time by 20% or more* – the perfect time-saver for every embroidery. * Compared to the DESIGNER RUBY deLuxe™ machine. Actual time depends on hoop and embroidery type. The Design Positioning feature joins large embroideries with perfect precision. The DESIGNER RUBY Royale™ machine has the largest embroidery area in its class*, allowing you to stitch spectacular designs with just one hooping. * Non-turnable; as compared to leading brands in similar price range. The sewing surface is designed for large projects and unlimited possibilities. Features 357 Embroidery Designs and 4 Embroidery Fonts in three different sizes. More than 1000 stitches, including; Utility Stitches, different Buttonhole Styles, Quilt Stitches, Decorative Stitches and Sewing Fonts.